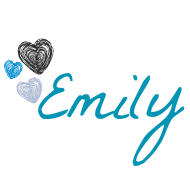 Hi guys, Emily here! 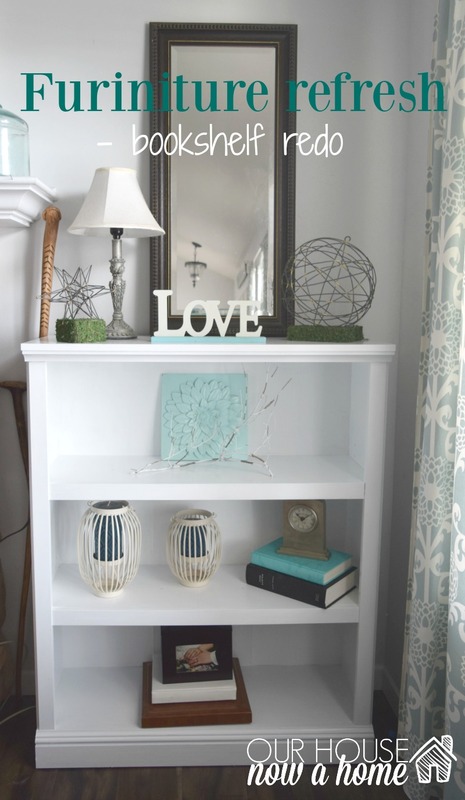 I love a furniture redo, I always enjoy the instant results of the work. 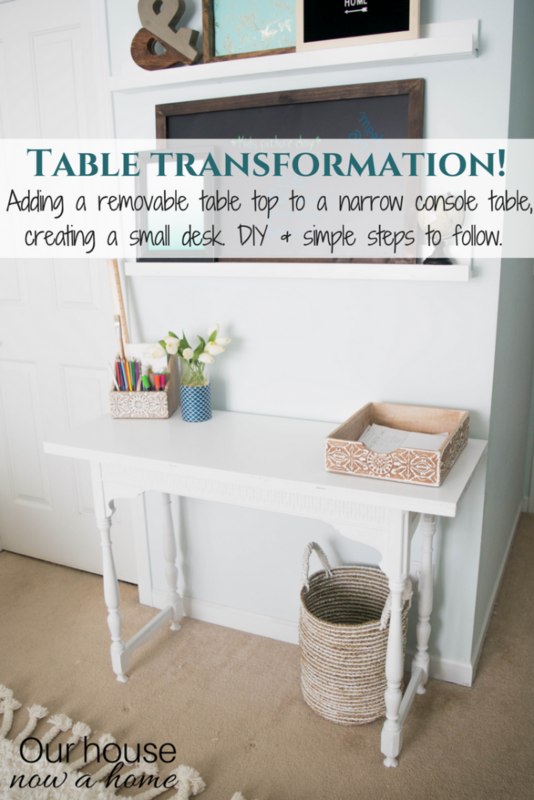 Which is why this post about How to turn a narrow table into a desk, DIY desk upcycle is a fun and simple project I am excited to share. It is weird that I need to mention who is the “voice” a blog post now with Mary here as well. 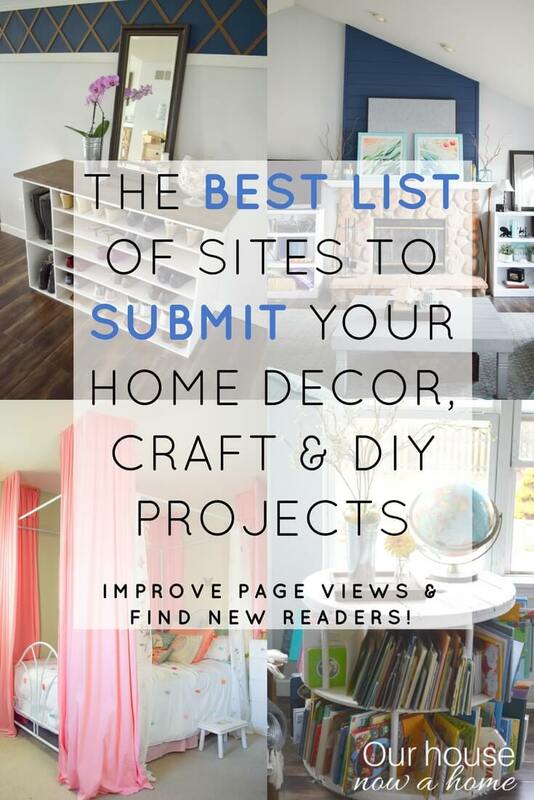 Just to let you all know, most of the time if it is a home decor, craft or DIY project it will be me (Emily) sharing. Recipes and gardening will be Mary and her yummy ideas. Anyways, I revealed my small office space that is in my bedroom last week. 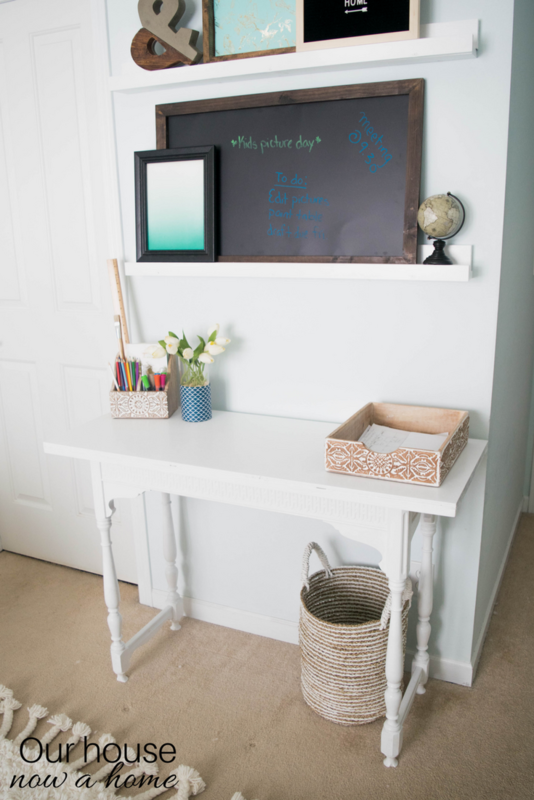 It featured a few DIY projects that I am finally getting to roll out to you, the first being how I made this small table become the perfect desk for this tiny and narrow area in my room. When I say this space is small, I am being very serious. 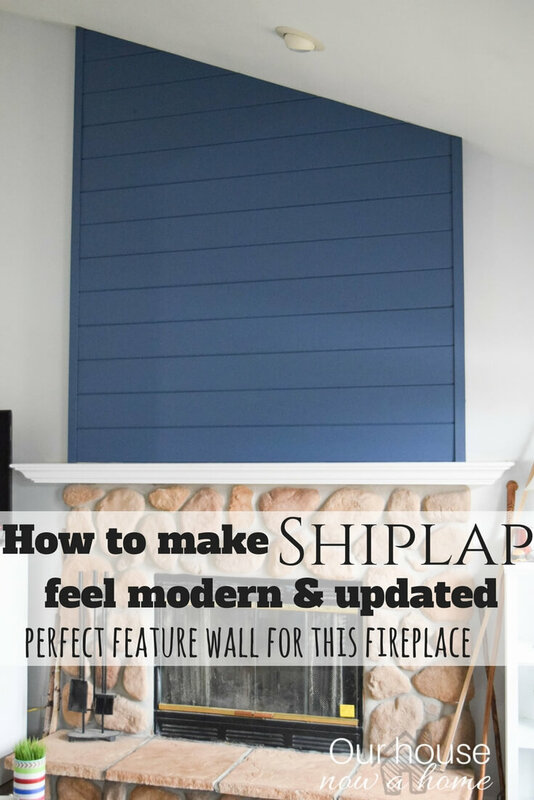 It is maybe 3 feet of wall space and anything here cannot be too bulky because it is the walkway into our bedroom, bathroom and closet area. So any furniture here has to be narrow. 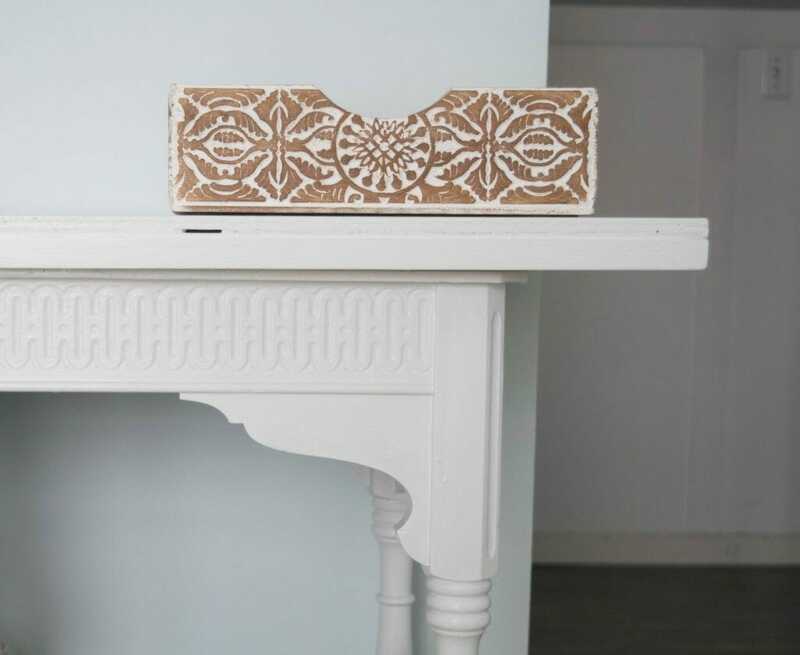 I had this console table that my Grandma gave me, it is gorgeous and has beautiful wood details to it. 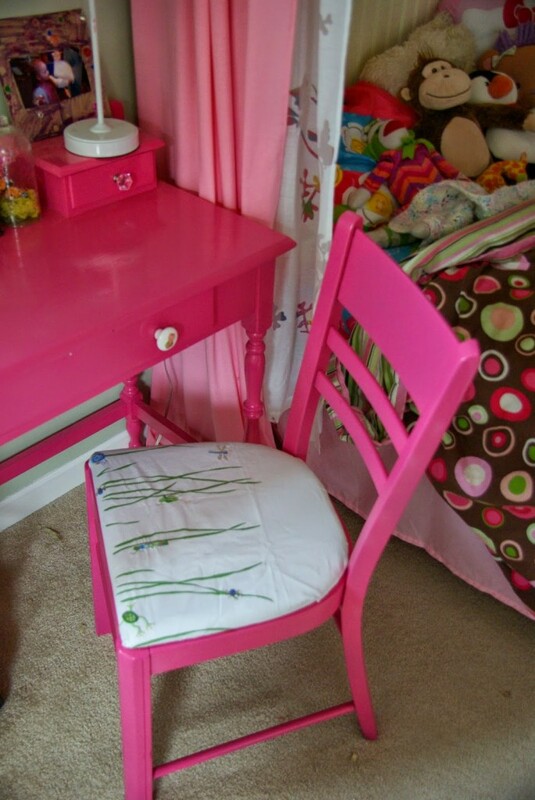 I actually remember her scraping bright green paint off of this table when I was maybe 6. She had found it on the side of the road and carried it home on her back during her morning walk. My Grandma is one cool 91 year old that was upcycling furniture before it was a thing. 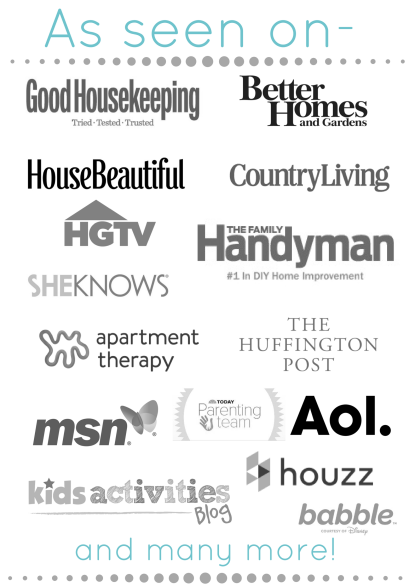 Magically knowing how to do all of the projects without Pinterest or Google telling her what to do. Since this is a special piece to me I do not want to damage it at all. However, I do need a workable space, and this small desk is really tiny! The plan is to use all of the wall space here, adding about 3 inches on each side to this table. Giving me just enough work space for my laptop to be and a writing space. 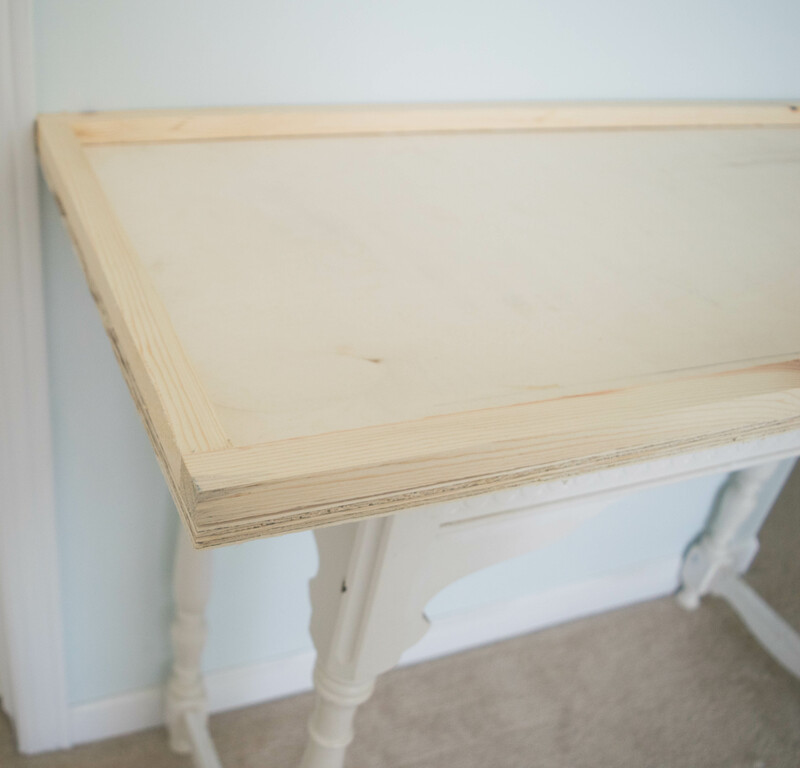 The trick is making this DIY desk upcycle with a removable top. I am not wanting to damage the small table at all, and may eventually put this back as a small console table. 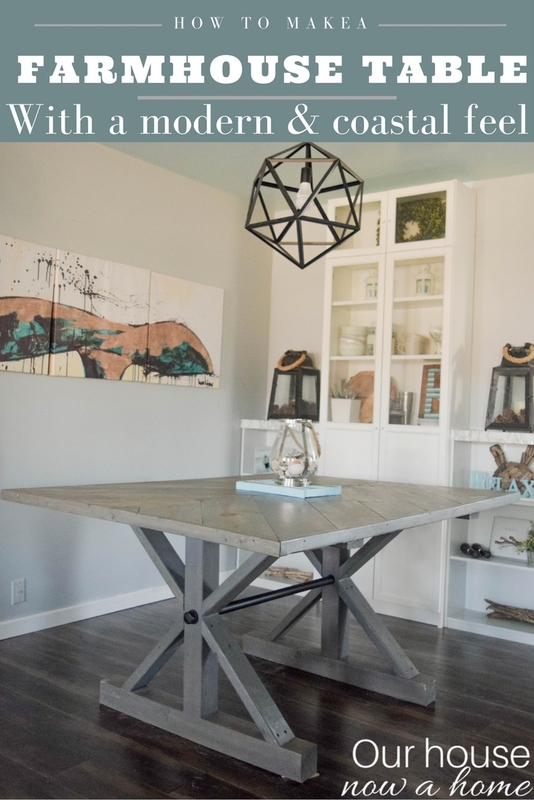 The reason why I am so excited to share this is because while you may not have this exact table to redo you may have a table that is not exactly the size you need. 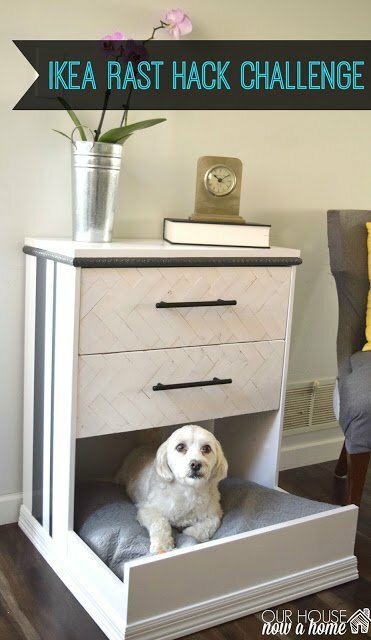 This little furniture redo hack can be used with any table, adding the removable top and customizing it for your needs. 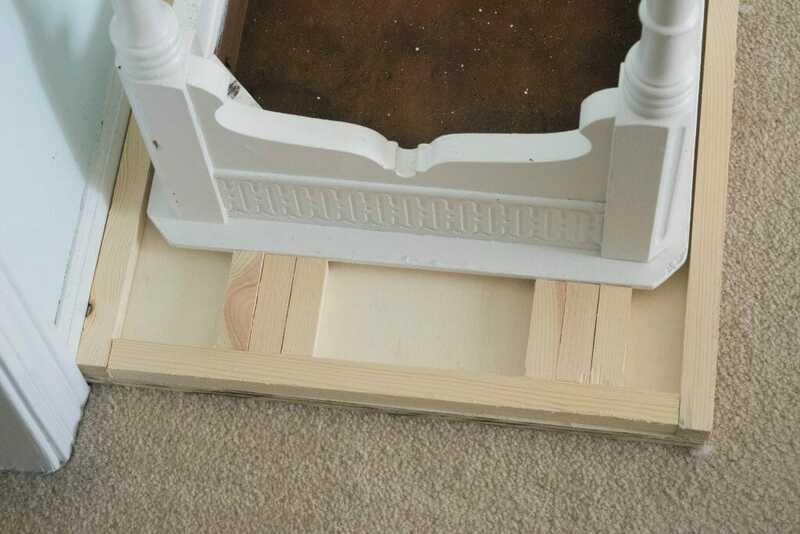 Then when done, take it off and reveal the pristine and untouched original furniture piece! For me, since I am using the wall as a guideline for the table size I just used a long board to mark where my desk top needs to end. 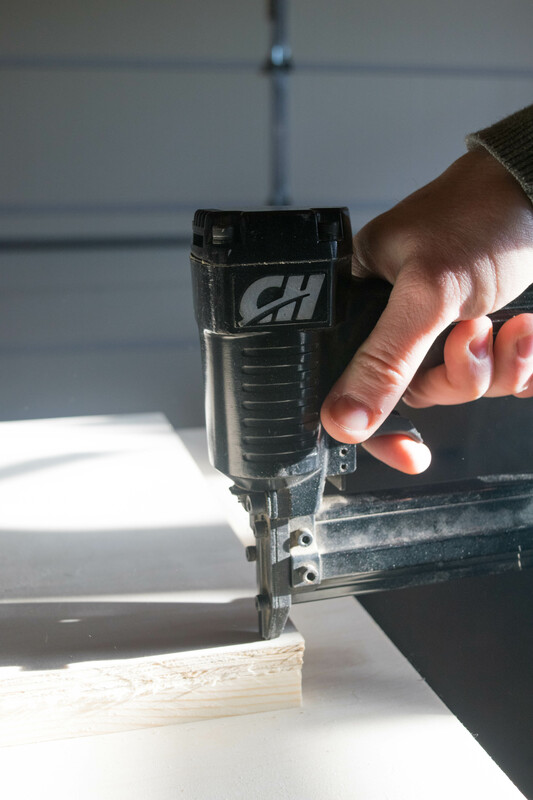 Using a table saw and cutting the board to it’s right size. 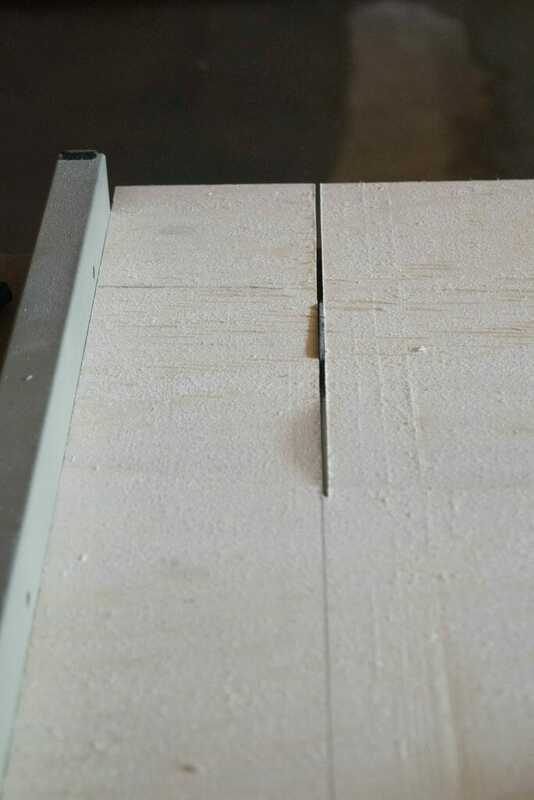 I was also careful to have a small overhang to the original table, allowing a trim piece to be added on the edge. My trim piece was random wood I had laying around my garage. 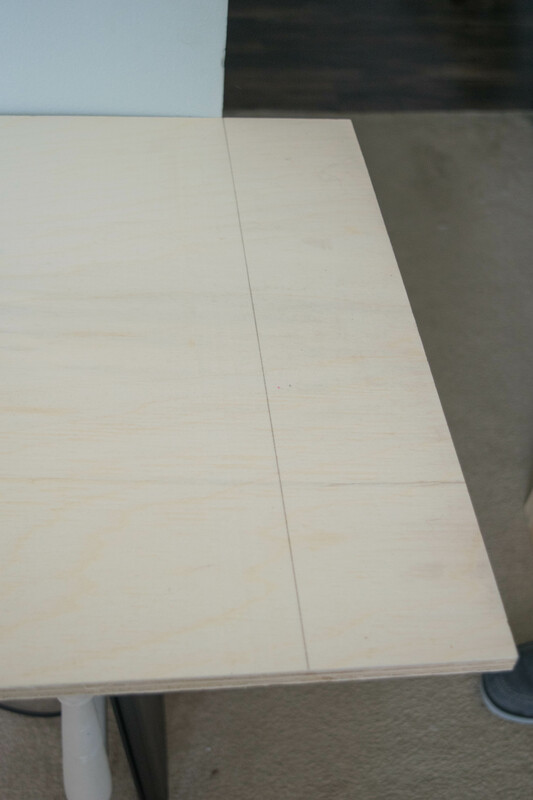 Measuring the desk top and cutting these 4 pieces down to size. Before connecting anything I brought it all into the house and lined it up onto the table, making sure I was right on sizing and cuts. I want this to be a pretty table and have to top appear like it belongs onto the desk. I used wood glue to attach the 4 trim pieces. Then for extra insurance I also nailed the trim pieces into place. Once all of that was ready to go I brought it back in. Technically I could be done with this little desk transformation as is. However I do not want the desk top to have any wiggle room or be able to slide around. So I decided to add some small wood pieces to each side of this table, wedging the original table into place. Measuring the space on either side of the table. Making sure it was as center as possible to the desk top. 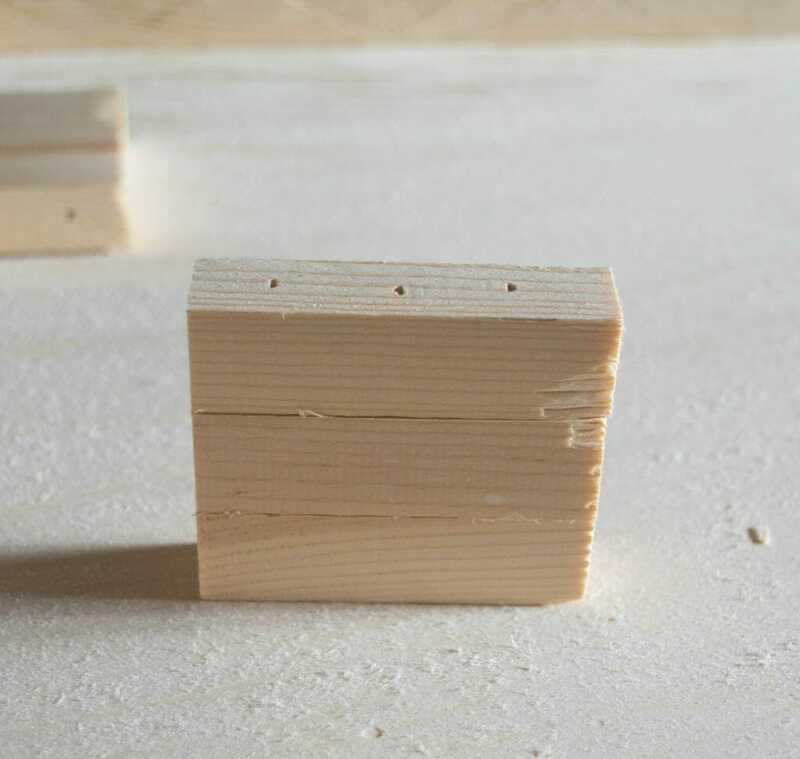 I used some scrap wood, piled them onto each other once they were cut to my correct side. Then nailed them to each other. Adding them to the underside of the desk top and nailing it all into place. I now have a new DIY narrow desk, and my Grandma’s table is still untouched with not one piece of wood nailed into the original table. Since I kept the costs down for this project the wood I used was pretty rough. 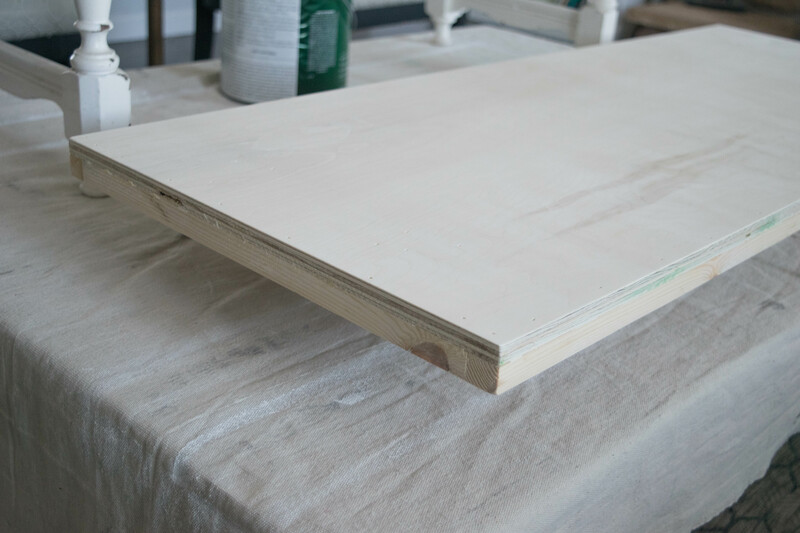 Sanding the surface down as well as the sides and corners will go a long way in making this desk top look like a great furniture piece. The one thing I did do to the original table was update the paint. 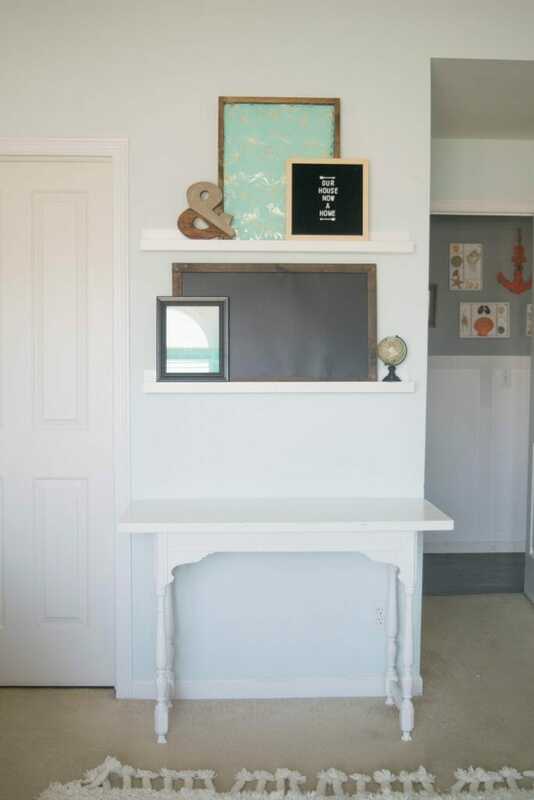 I love the simplicity of the white color, but since this table has not been painted since my Grandma did that when I was little the original desk was an off white. So I painted the desk top as well as the table. 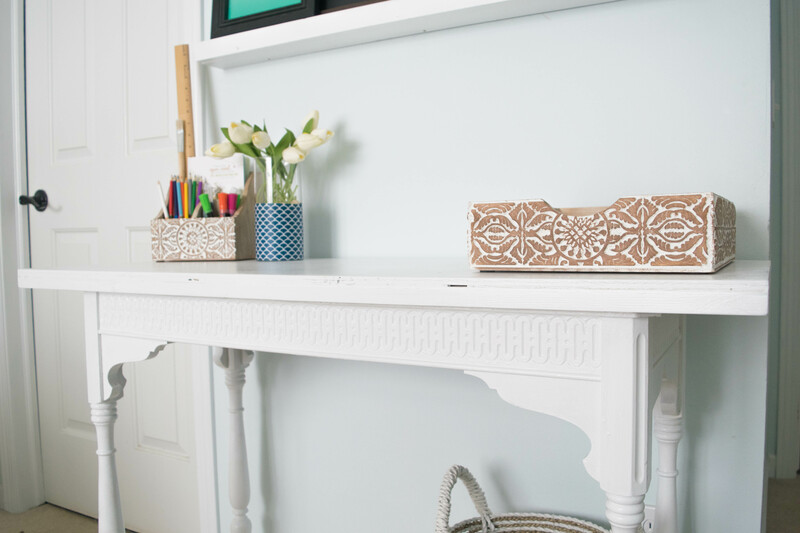 Creating one cohesive, and perfectly white small desk upcycle! I was very aware of the trim being small on the desk top. I still wanted to be able to see the great detailing on the desk that is towards the top. That is my favorite part about this desk, small inlay like that really make a furniture piece stand out. This small desk is the perfect place for me to get work done during the day and it does not take up much space at all in my bedroom. 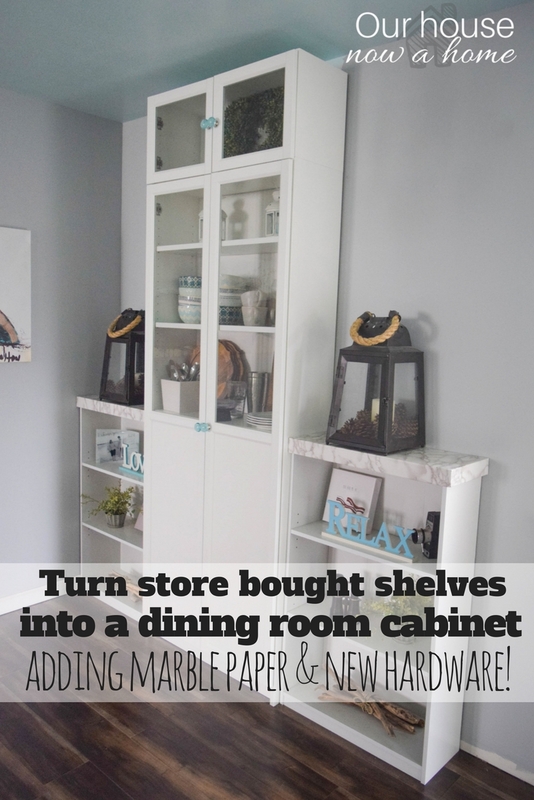 Being careful with the decor items I used here and picking some new desk organization items really helped bring it all together. This has become my kids favorite homework spot as well. I was able to keep the details in this desk stay visible by doing multiple coats with less paint on the brush than I normally would have. This way the paint did not clump into the pattern on the desk. As you can see, the overhang on this desk is really small. 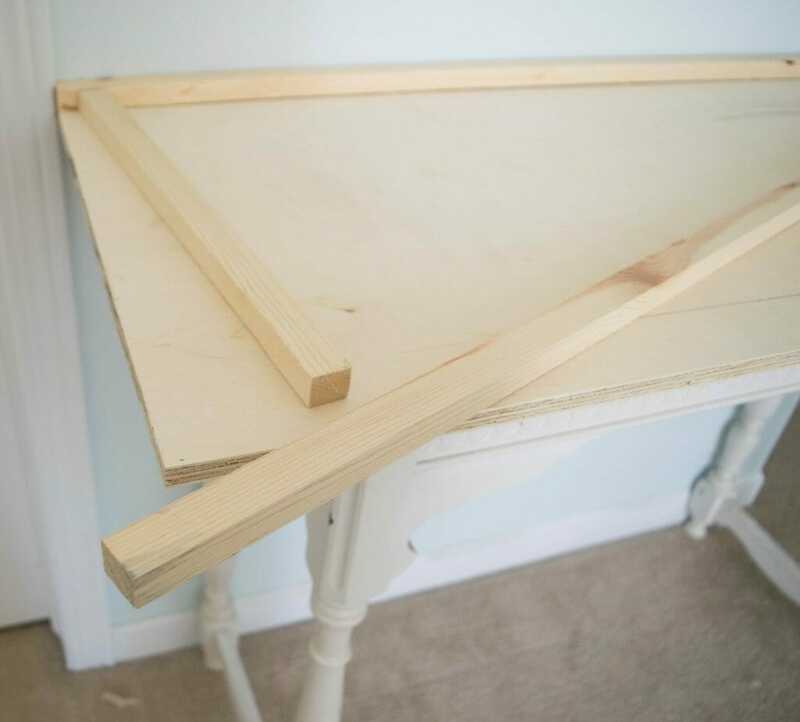 Which makes the desk top look authentic to the table itself, and there was no ruining my Grandma’s table! 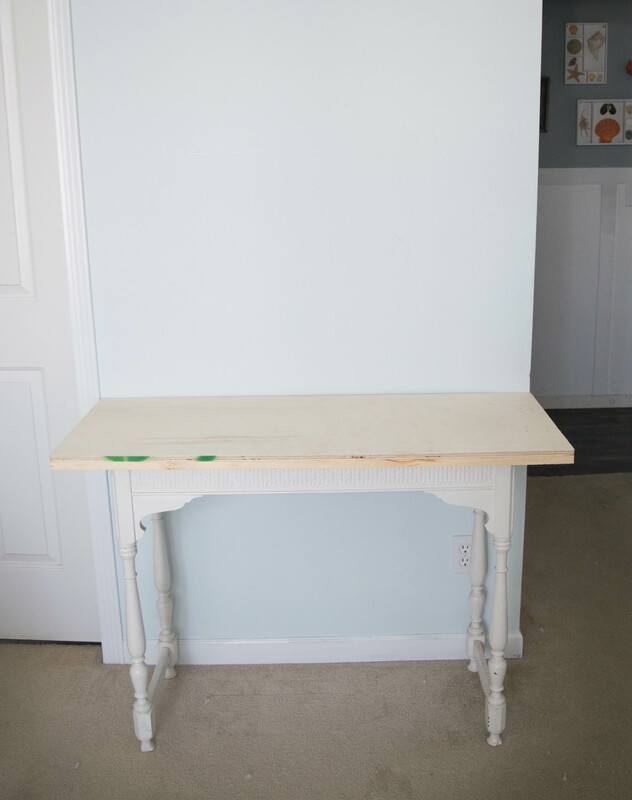 This narrow table into a desk, DIY desk upcycle was actually a really quick and simple furniture project. The cuts were really straight forward. 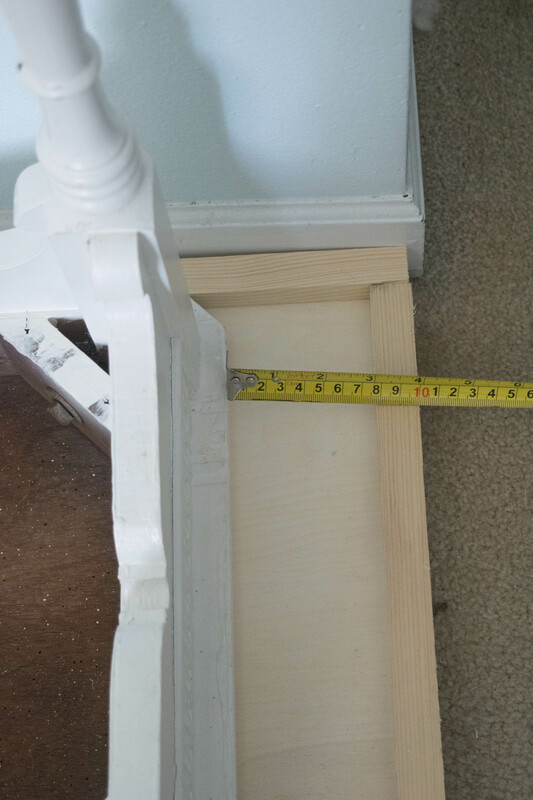 With my tutorials here on the blog I usually like to share measurements, but since this project is all about creating a custom piece to work with a particular piece of furniture what you may be working with and measurements needed will be very different from mine. So if you have questions or need more details and measurements explained let me know in the comments and I will give you more details. This little nook in my bedroom has become such a calming and relaxing place for me to work. Before when the desk was too small and disorganized I found myself grabbing my laptop and working somewhere else. Having a designated work space really improves my productivity. Since I am my own boss I try and keep to a routine and having a place I go to work each day has been great. I tried to keep the decor and overall feel of this work space blend in with the rest of my bedroom. I did not want it to feel like I stuck a big desk in the corner and called it a day. 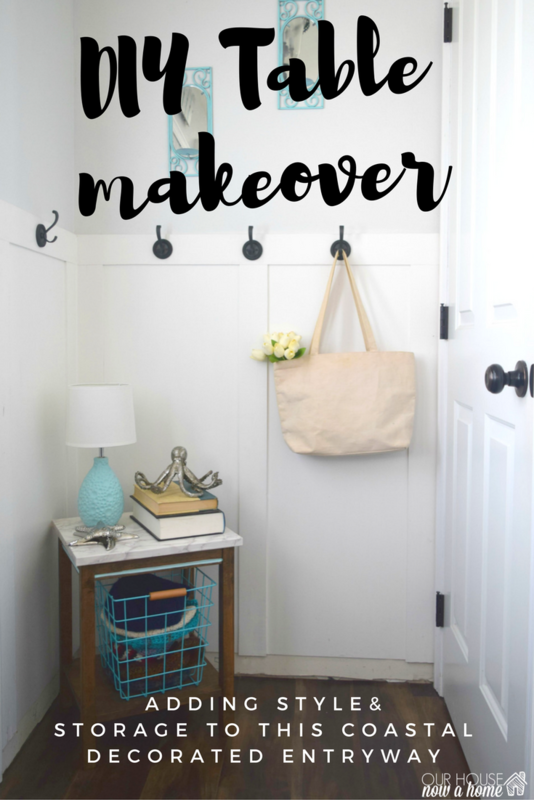 My mini bedroom update will be shared next week so you can see what the rest of the room looks like! If you re fortunate enough to have some special family furniture pieces it can be difficult to make them work for your home. The guilt of ruining it, or permanently changing things can be too much. 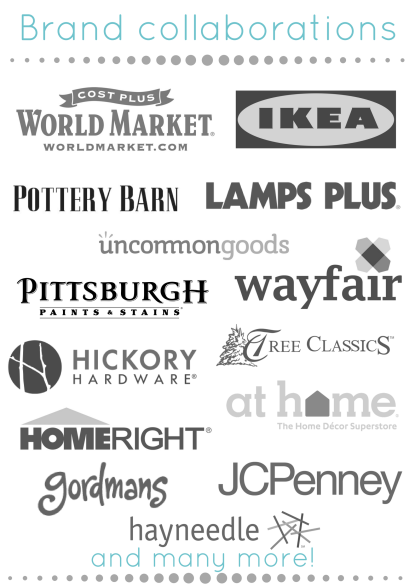 Which leaves you with a special furniture piece but that maybe is not 100% a good fir for your home. 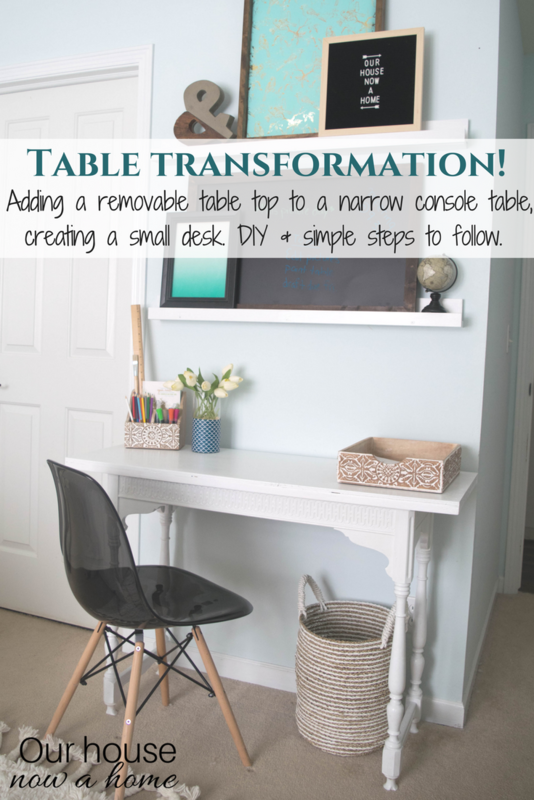 This little hack and How to turn a narrow table into a desk, DIY desk upcycle with a removable table top is the best way to use that special furniture in your home and have it be perfect for you too! 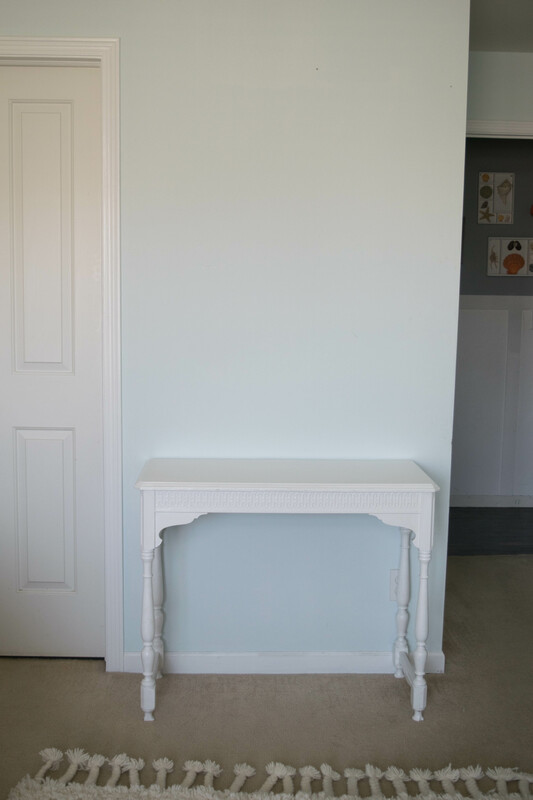 My Grandma always wanted me to paint this desk a bold color, but I like that even though I updated the paint it still feels very much like it did when it was in our home growing up. Some things are good to keep the same, a classic table like this is pretty enough on it’s own! My husband made a table similar in size of me. I am using it for something else right now. I will have to remember it would make a great size small desk if ever needed. 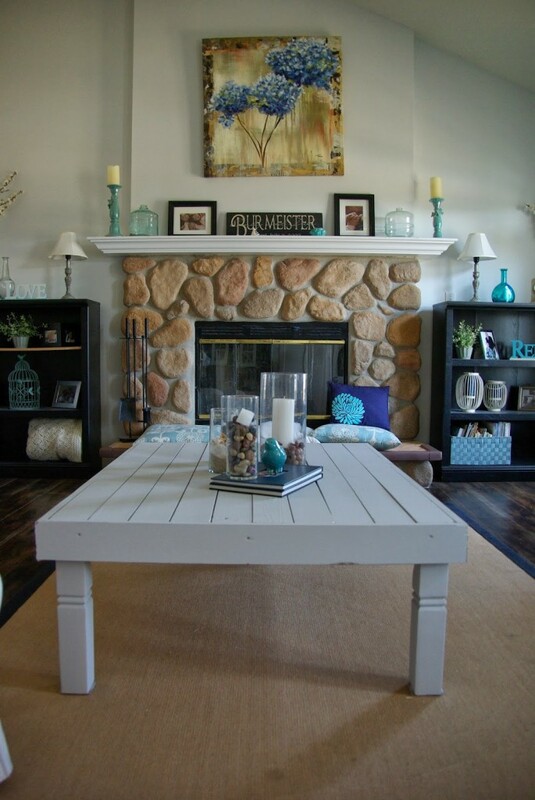 That is awesome your husband made you a table, I am glad you got some ideas from this table I shared! 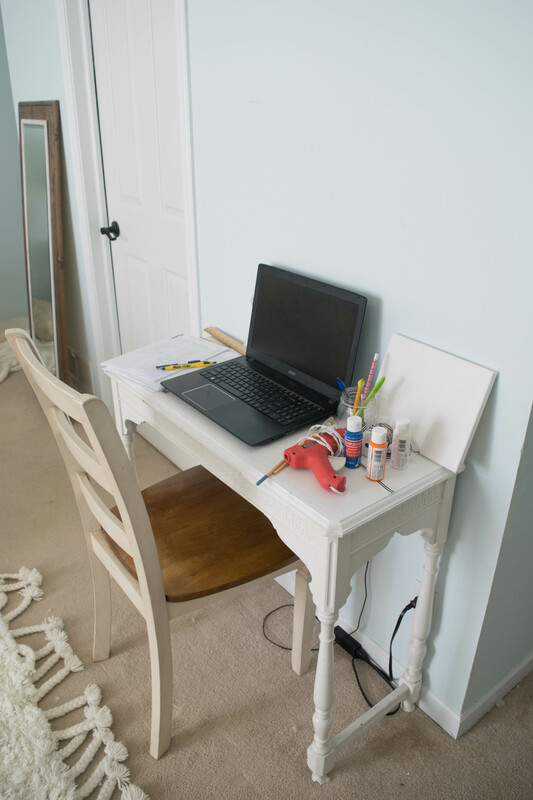 My parents used to have a narrow desk like that and it ended up being the “junk spot” where we dropped our keys, the mail and other random things. I like what you did with yours much better! Thank you! We have a counter in our kitchen that has become the drop off spot, I am always trying to keep it neat and clean! I just love how this turned out. So gorgeous. 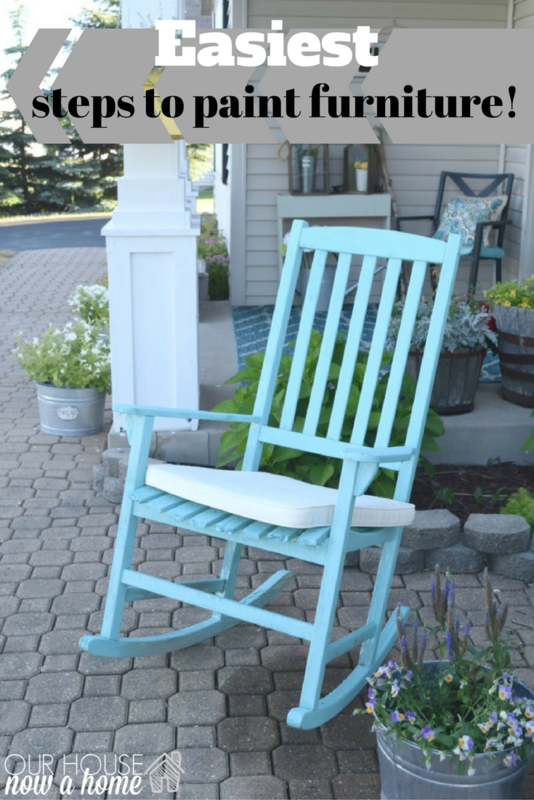 I need something like this by the front door. I take tons of photos so I’d put frames on it. 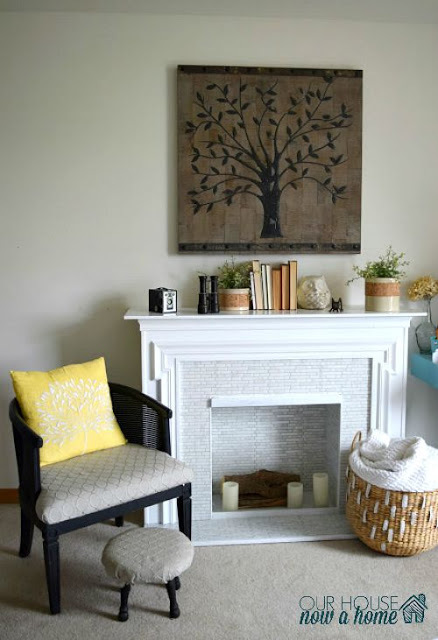 Something like this with picture frames on it would be amazing! That looks beautiful! You did a wonderful job on making the desk look as good as it does. I wish I was handy enough to do something like this. You should seriously sell desks like this. Wow that is such a tiny desk! Way to make the most of small spaces. Thank you so much! It has been a struggle to make this tiny spot in my bedroom work as an office but I think I have figured it out now! Wow, this is impressive. I would never have thought about adding a top to an existing table like that. This looks neat and professional, a great table for a small space. What a great idea. 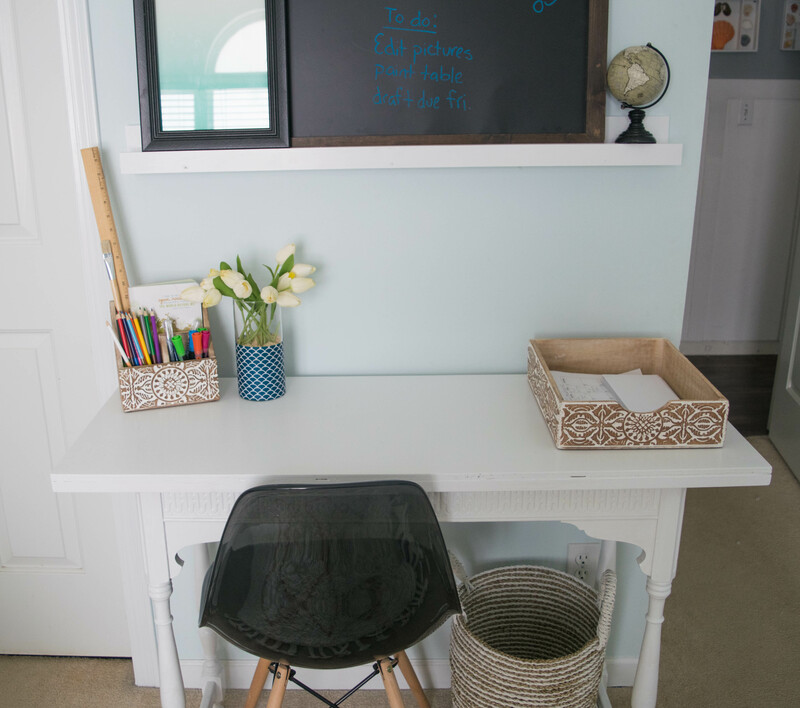 We live in a small home, so finding space saving workspaces is essential! You did a wonderful job with this! I hope to work more with wood in the coming years to make things I really want or need. 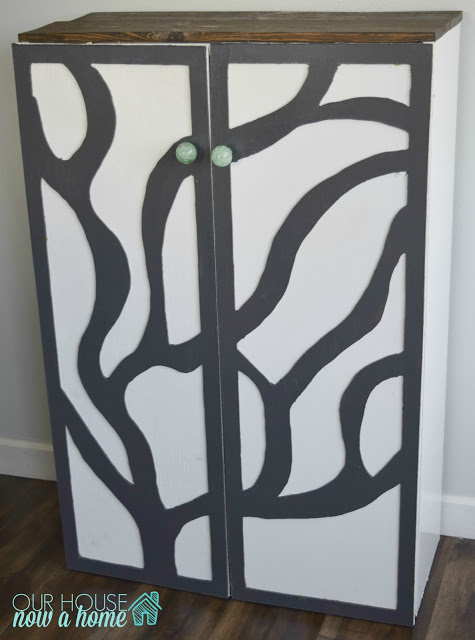 My next project is a wooded coat rack! Wish me luck! Thank you so much! Good luck on your wooden coat rack! It is so fun to work with power tools and make something you are proud of. 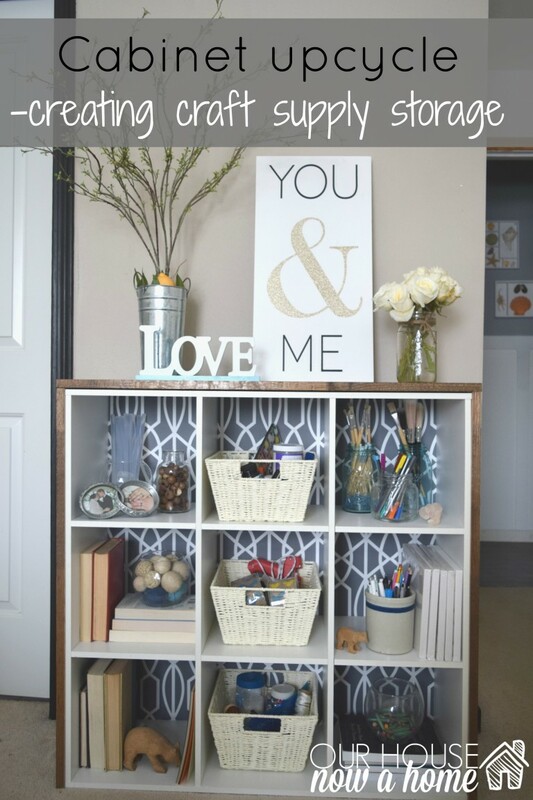 Great idea for a small space and to reuse the table! I love the functional shelves on the wall above. Emily! What an amazing thing you have done to the table Grandma gave you! I can not remember when she bought that table but I know it has been something she has had at least as long as you have been alive, so when she gave it to you it made me very happy! The way you and Dale turned it into something you can use everyday is awesome! 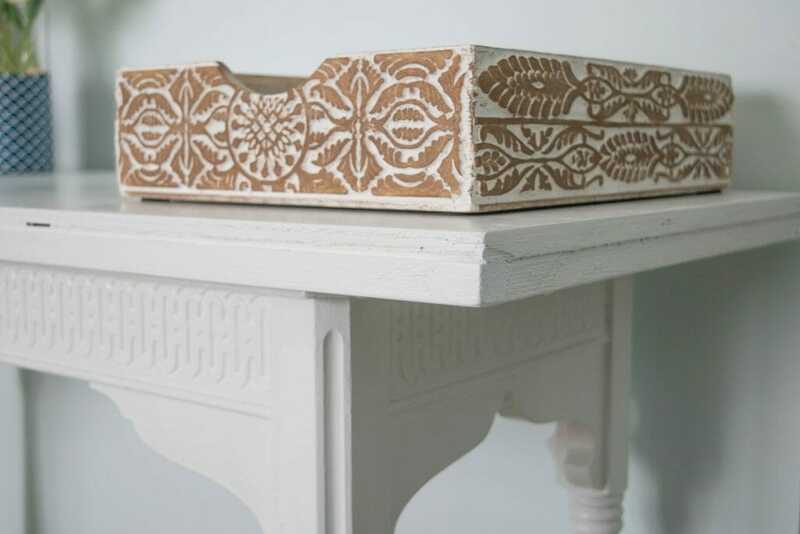 It is a nice small table and fits perfect in your small space, to recreate it how you have! Love it! 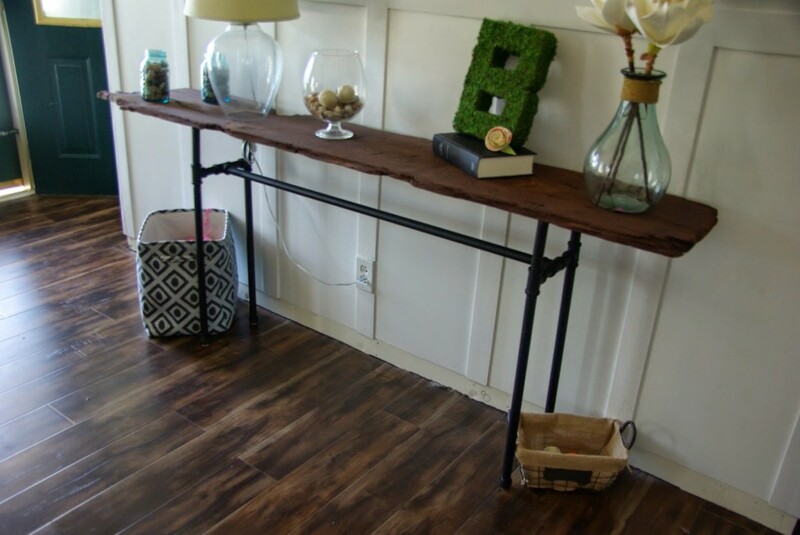 What a crafty idea altering the console table just enough to have a desk! I used a makeup vanity table once for the same. I love how it turned out! That is a great transformation. 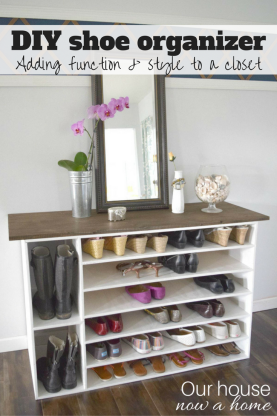 I have to do something similar for our entryway. I need a console table for that area. This is such a great transformation! I have a very similar desk in my office that I payed WAY too much for. I should have been more creative like you! Love the way it came out! 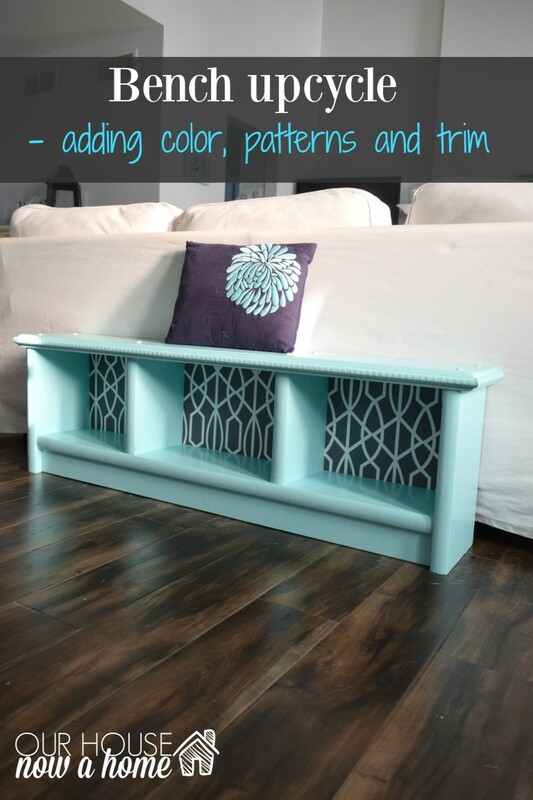 I think I can convince my husband to make this for me lol it would look adorable in my kids play area! 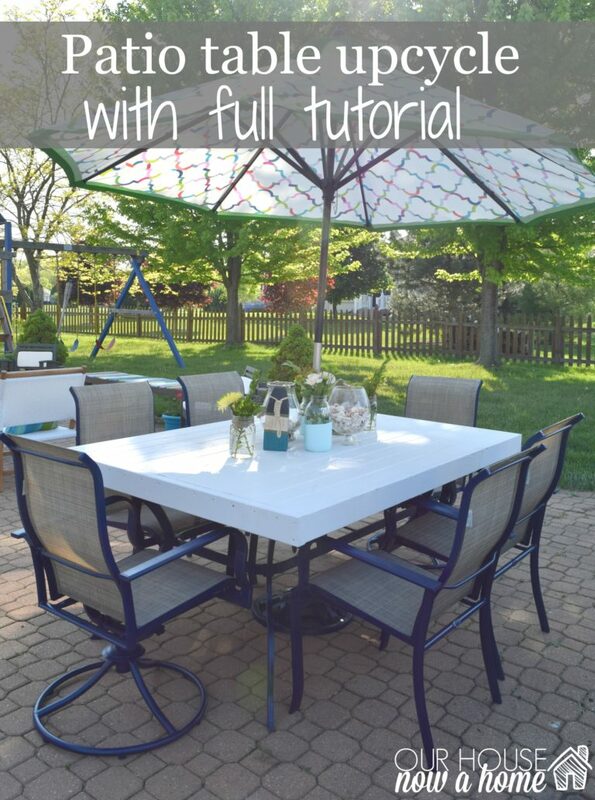 What a great way to repurpose a table. I love how it looks as a desk. And it’s the perfect size. Great job! 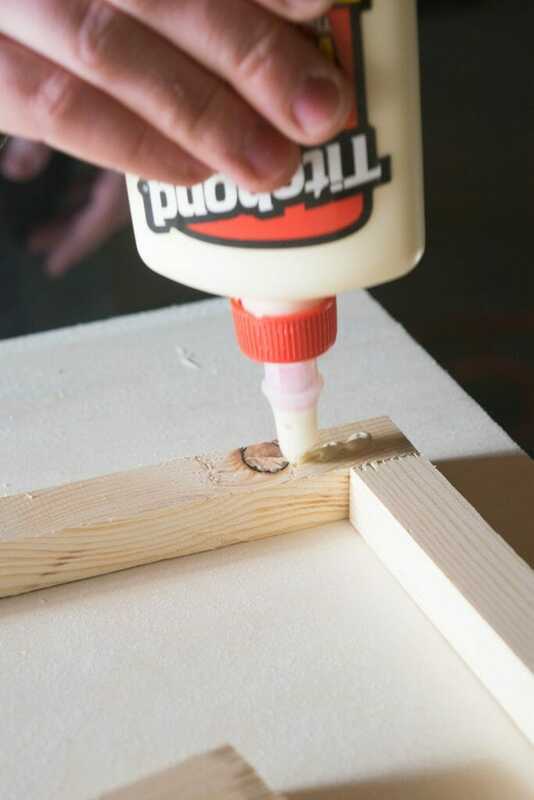 This is a great DIY. 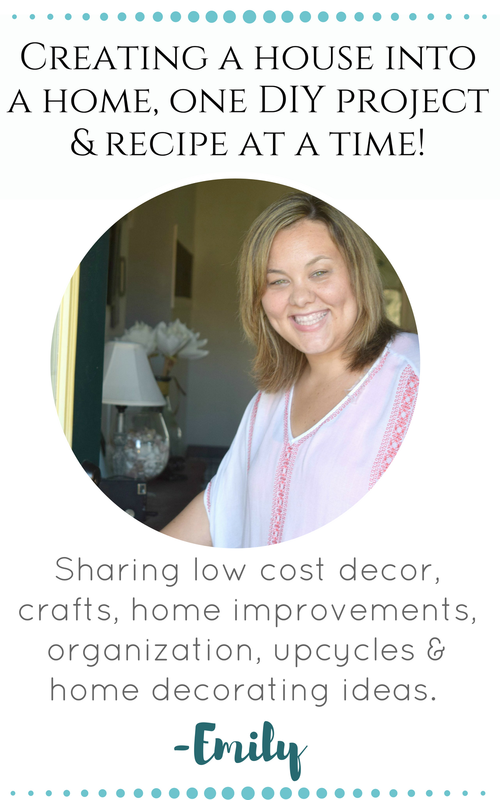 I want to create a better workspace in my home for blogging. What a fantastic space! And while I know it took a lot of work, it looks like a fairly easy DIY for someone who knows what they are doing! 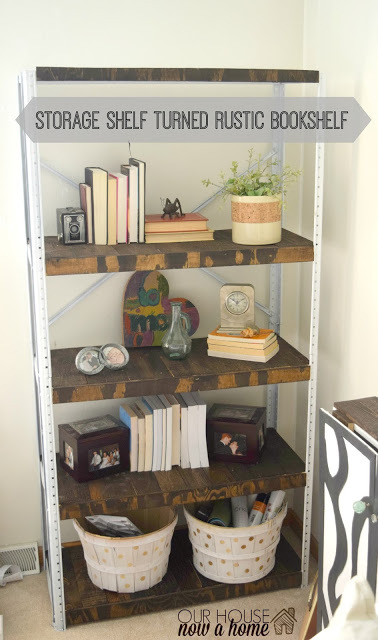 What a great DIY project sometimes we do not realize that things we have at home can be revamped to become better pieces and more practical for our needs, You have inspired me! Great idea. I love my current desk, it was only $20. 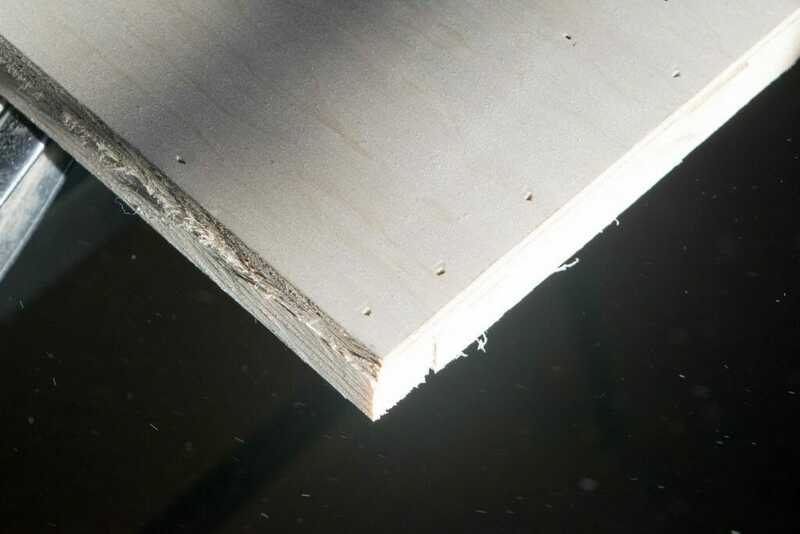 However I need more table surface, this is exactly what I need to fix my issue. This is such a creative idea! 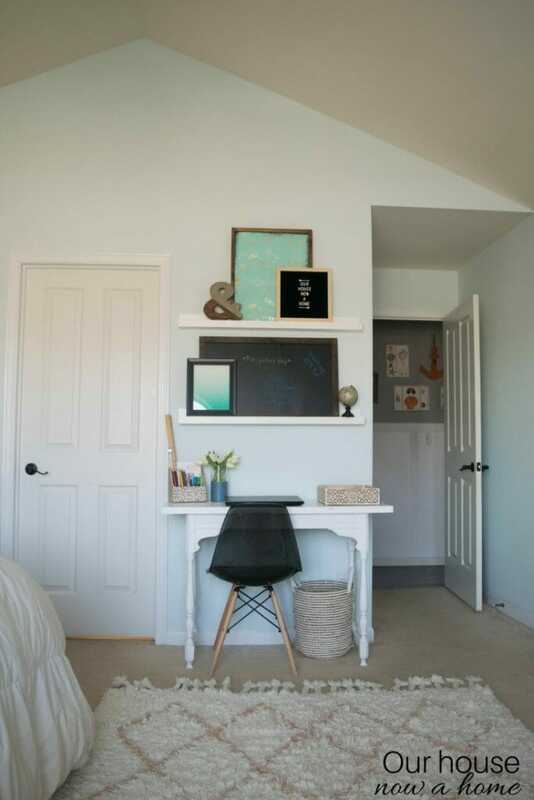 I think this is perfect for anyone who is short on space or looking for a more minimal desk option! You did a great job with this console table. I would have never thought to make a little desk with one. 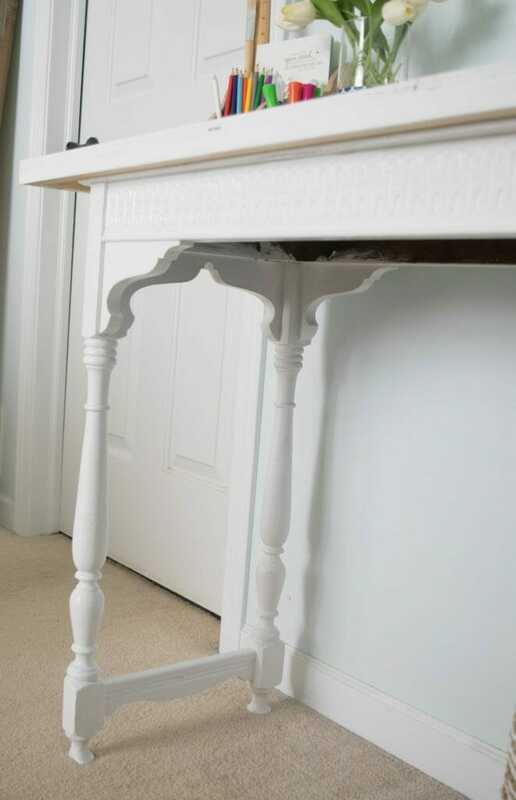 I want to try my hand at upcyling some furniture. Hopefully my husband will help me out. That is so creative it looks new now. 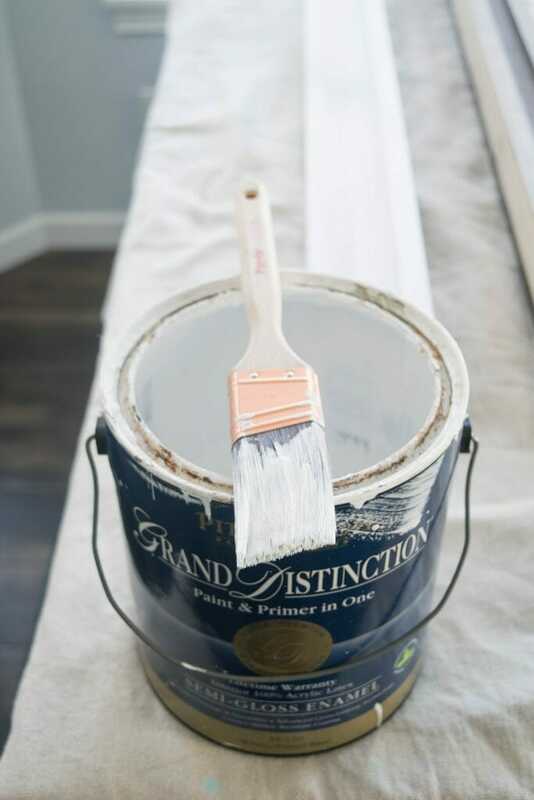 The white color matches to any painted walls. 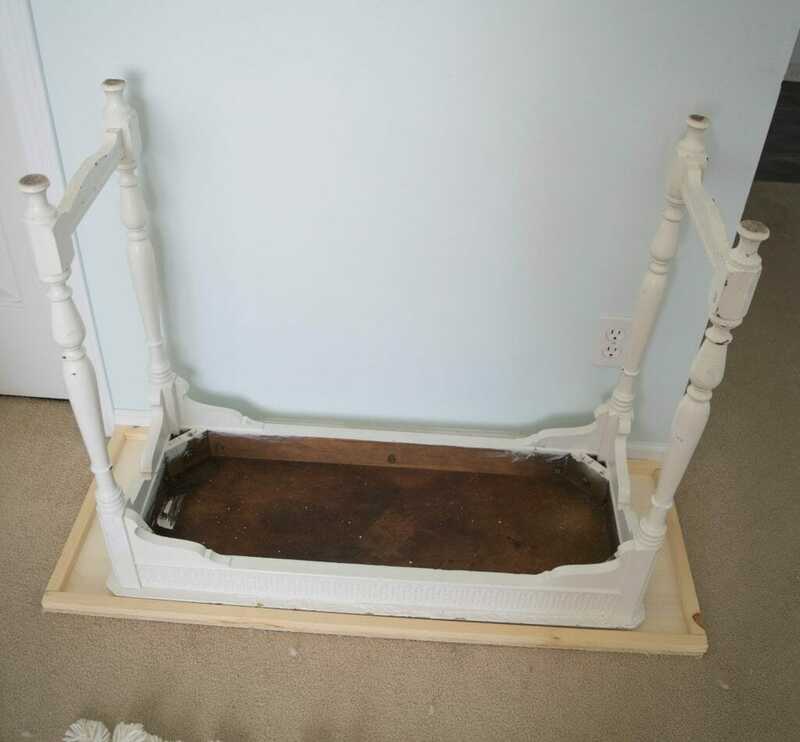 I do have an old table I wanted to make it as accent table close to our stair. I would use this as a guide. What a great idea that is! I would love to that in my small table upstairs, it would make a big difference. That is some very nice handy work! I like how simple you made this upgrade look. It looks so incredible! 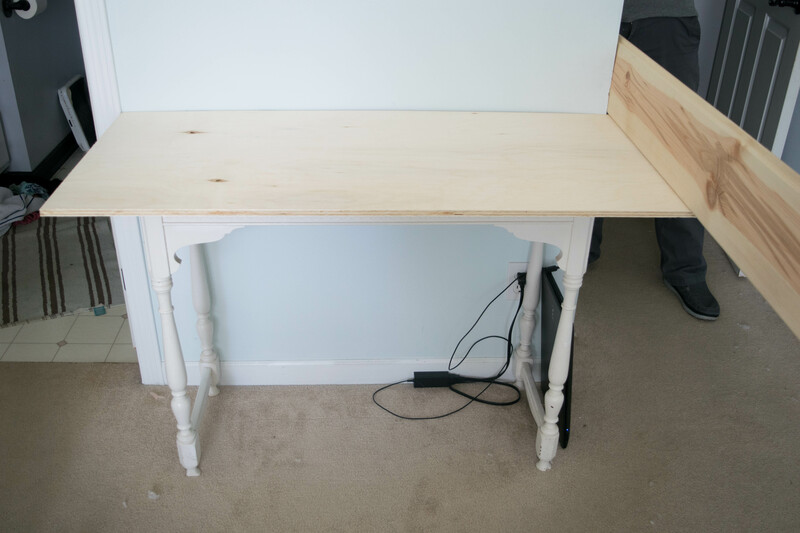 Wow – the work on it makes it look like an expensive table, so it barely takes up any room! This is very creative and a very beautiful space. I’ve been thinking of rearranging my desk area as well.